The aim of the study was to investigate predictor factors related to self-perceived food environment, food practices, and family support and fruit and vegetable intake during pregnancy. A cross-sectional study was conducted among 282 pregnant women at the second trimester of pregnancy living in the city of Ribeirão Preto, Brazil. A food frequency questionnaire, and two 24-hour dietary recalls were obtained, and the Multiple Source Method was used to estimate the usual intake. Self-perceived food environment, food practice and family support were assessed by structured questionnaires. Logistic regression models adjusted for education, age, socioeconomic class, and BMI by gestational age were used to evaluate the relationship between self-perceived food environment, food practice and family support and fruit and vegetable intake. No association between self-perceived food environment and fruit and vegetable intake was found. However, the women who reported a greater number of meals per day [OR 1.95 (95% CI = 1.06; 3.56), p = 0.03], those who believed they consumed enough fruit and vegetable [3.71 (2.23; 6.20), p < 0.001], and who reported to have family support for a healthy diet [3.16 (1.78; 5.60), p < 0.001], were more likely to consume greater amounts of these foods. Our data suggests that the family support and a higher number of meals per day might be relevant to achieve a higher fruit and vegetable intake among pregnant women. Key words: Food environment; pregnancy; fruit and vegetable intake; self-perceived environment. O objetivo do presente estudo foi investigar fatores preditores relacionados à percepção do ambiente alimentar, práticas alimentares e suporte familiar e o consumo de frutas, verduras e legumes durante a gestação. Trata-se de um estudo transversal, conduzido entre 282 gestantes residentes em Ribeirão Preto, SP, Brasil, durante o segundo trimestre gestacional. O consumo alimentar foi avaliado por meio de um questionário de frequência alimentar e dois recordatórios de 24 horas. Para estimar o consumo usual de alimentos foi utilizado o Multiple Source Method. A percepção do ambiente alimentar, práticas alimentares e suporte familiar foram avaliados por meio de um questionário estruturado. Modelos de regressão logística ajustados por escolaridade, idade, classe social e IMC por idade gestacional foram utilizados para avaliar a relação entre a percepção do ambiente alimentar, práticas alimentares e suporte familiar com o consumo de frutas, verduras e legumes. Nenhuma relação foi encontrada entre a percepção do ambiente alimentar e o consumo de frutas, verduras e legumes. Por outro lado, as gestantes que relataram um maior número de refeições ao dia [OR 1,95 (95%IC = 1,06; 3,56), p = 0,03], aquelas que consideravam que consumiam uma quantidade suficiente de frutas, verduras e legumes [3,71 (2,23; 6,20), p < 0,001], e aquelas que relataram suporte familiar para ter uma alimentação saudável [3,16 (1,78; 5,60), p < 0,001], apresentaram maior chance de consumir uma maior quantidade destes alimentos. Os resultados sugerem que o suporte familiar e um maior número de refeições sejam relevantes para o alcance do maior consumo de frutas, verduras e legumes entre gestantes. Palavras chave: ambiente alimentar, gestação, consumo de frutas verduras e legumes, percepção do ambiente. Graduate Program in Community Health, Department of Social Medicine, Ribeirao Preto, Medical School, University of Sao Paulo, Brasil. The adequate intake of fruits and vegetables (FV) during pregnancy (≥ 400 g/day) (1) has a positive impact on women’s and babies’ health. FV intake during pregnancy is inversely associated with neural tube defect (2), and allergies (3) in children, and also prevents excessive gestational weight gain in women (4). The main determinants of eating behavior include individual (5), social, cultural, physiological, and environmental factors (6). Currently, environmental factors have received significant attention in public health studies because of their association with the behavior and choices of individuals, directly affecting their health (6). Previous studies suggested that the neighborhood in which the individual resides is associated with food access, availability, price, and characteristics, as well as the quality of the diet and well-being. For instance, a neighborhood considered safe, with places to practice physical activity and several food stores may lead to increased physical activity and a better food selection, contributing positively to the health of adults living in these areas (7). A cohort study conducted with American pregnant women found that living at a distance greater than four kilometers from a supermarket correlated negatively with scores of the Healthy Eating Index during pregnancy (8), suggesting that the easy access to unhealthy food might influence the lifestyle during pregnancy. Most studies assessing the food environment were based on objective measures such as the Geographic Information System (GIS), which maps the distance between the residences of participants and stores of interest, and/or store audits to objectively measure dimensions of the food environment (9). 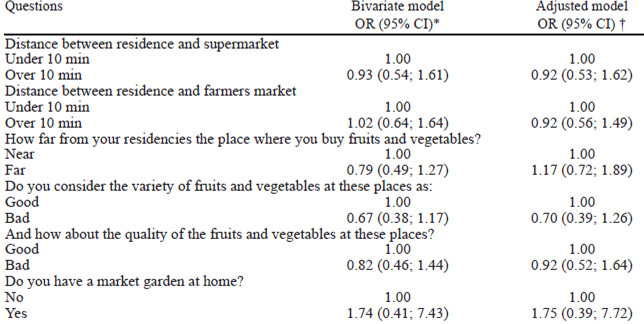 Conversely, perception-based measures are subjective ways to evaluate the local food environment characteristics using self-report questionnaires by the residents to detect the access, availability and quality of healthy foods (9, 10). It should be noted that the interaction between individuals and the environment is much more complex and dynamic than objective measures alone are able to measure (9). Flint et al (11), on secondary analysis of the data from the Philadelphia Neighbourhood Food Environment Study, investigated the perception of neighborhood food environment and the FV intake by adults living in two low-income Philadelphia neighborhoods. Perception of food environment was measured using five related dimensions pertaining to quality, choice and expense of local food outlets and locally available FV. Multivariate regression analyses suggested that measured dimensions of neighborhood food environment did not predict FV consumption. This study aimed to evaluate the relationship between self-perceived food environment, food practices, and family support and the consumption of FV among pregnant women. The present study is the first study to investigate the relationship between food environment perception and FV intake in pregnant women, and the first such study conducted in a developing country. This is a cross-sectional study conducted among adult singleton pregnant women at the 24th gestational week onwards attended by the Brazilian National Health Service in Ribeirão Preto, São Paulo state, Brazil. This study is part of an investigation about the relationship between food intake during pregnancy and gestational diabetes mellitus. The inclusion criteria were: age ≥ 20 years, pre-pregnancy body mass index (BMI) ≥ 20 kg/m2, absence of type 1 and type 2 diabetes, no reported use of medications that alter blood glucose, and no report of diseases that alter usual food consumption such as chronic renal failure, AIDS, and cancer. Recruitment of the women, and data collection occurred in five county laboratories, where there is greater demand for pregnant women to carry out the oral glucose tolerance test (OGTT), which are located in areas with a higher proportion of pregnant women in the city. Nutritionists were available at these sites five days a week. All pregnant women who went to these laboratories between May and November 2012 were invited to participate in the study. In total, 509 women were contacted. Of these, seven declined to participate, 219 did not meet inclusion criteria, and one woman had missing data, leaving a total of 282 pregnant women in our sample. Sample size calculations were based on a prevalence of 13% of adequate intake of FV by the Brazilian population (14), and an estimated 10% rate of non-response, resulting in a minimal sample of 190 pregnant women. All participants signed an informed consent form. The study was approved by the Research Ethics Committee of the Ribeirão Preto Medical School, University of São Paulo and authorized by the Municipal Health Department of Ribeirão Preto, São Paulo. All the procedures were in accordance with the Helsinki Declaration. The perception of pregnant women about the food environment, food practices and family support for a healthy diet was assessed through a structured multiple choices questionnaire. The questionnaire was developed based on an international study that evaluated the relationship between the food environment and health outcomes (10). The questions to assess the food environment included distance (less or more than 10 minutes of walking) between residence and places where food are purchased (supermarket, farmers market, street vendors, coffee shop, grocery stores, bakery, convenience store sor restaurants); walking time to the nearest food store (near or far), perception about quality and variety of FV where they were acquired (good or bad), and presence of market garden at home (yes or no). The questionnaire to assess food practices was based on eight questions: number of meals per day (up to three, four or more); places where subjects usually have meals outside the home (at work, friend’s or relative’s houses, restaurants, fast food outlets, selfservice restaurants, coffee shops); transport used for shopping (car, motorcycle, bus, bicycle, none); places where subjects usually buy food (supermarket, farmers market, street vendors, convinience stores); frequency of shopping FV (one or more times a week, less then once a week); whether they would buy more FV if those were less expensive (yes or no); whether subjects get FV from other people (yes or no) and selfperception about consuming enough FV (yes or no). To assess the family support to have a healthy diet the women were asked to report if they have a family support to buy and cook healthy foods (yes or no). The reproducibility of the questionnaire was previously evaluated in a sample of 48 adult pregnant women with BMI < 30 kg/m2 attended at a Public Health Care Unit of Ribeirão Preto, São Paulo state, Brazil. Most questions had near perfect or strong agreement (Kappa = 0.79–1.0), as described elsewhere (15). Briefly, those with poor agreement were reformulated before the questionnaire administration in the present study; the question “Would you eat FV more often if they were less expensive?” were originally “Do you consider that the price of FV is very expensive, expensive, or cheap? ; and the questions “Do you usually buy food at supermarkets?” , and “Do you usually buy food at farmers market?” were previously condensed into a single question with unique answers, which made it difficult to interpret by the women. However, no validation studies were conducted to evaluate the accuracy of the questionnaire. In the present study, only fresh FV intake was considered. A food frequency questionnaire (FFQ) and two 24-hour dietary recalls (24hRs), on nonconsecutive days, were obtained at the second trimester of pregnancy to estimate FV intake. The FFQ was previously developed and validated for pregnant women of Ribeirão Preto (16), which includes 10 options of vegetables, and 12 options of fruits, and the time reference is the establishment of the pregnancy (as estimated by the physician). The 24hRs were collected by previously trained nutritionists using the multiplepass method on week and weekend days, indistinctly. The Multiple Source Method (MSM), a software developed by the Department of Epidemiology of the German Institute of Human Nutrition Potsdam-Rehbrücke (17), was used to estimate the usual intake of FV, in which the frequency of intake was included as covariate for the model. This method estimates the usual intake of foods in three steps: 1. logistic regression models are used to estimate the probability of intake, 2. linear regression models are employed to estimate the usual intake, corrected for variability, and 3. the probability of ingestion on a random day (step 1) is multiplied by the usual intake on a day of consumption (step 2) to produce the usual intake. The MSM software is available at http://msm.dife.de. Weight (kg) and height (m) were obtained using a digital scale (Tanita model HS 301) and a portable stadiometer (Sanny model ES 2040), respectively. The asessment of adequacy of BMI by gestational age was based on Atalah criteria (18). Gestational age was based on ultrasound data, or derived from the last menstruation period recorded on the prenatal card. Socio-demographic data were obtained using structured questionnaires. For social class classification, the Brazilian Criteria for Economic Classification was used, which categorizes socioeconomic classes from class A (highest level) to class E (lowest level) (19). The frequency distributions of socioeconomic variables and the median and percentiles (P25; P75) of FV intake were calculated. For descriptive analysis, Chi-square test was used to verify differences across categories of intake, and the Kuskal-Wallis test was used to test for differences in median intake according the characteristics of women. The median intake of fresh FV (178 g) was employed as a cutoff point for a higher intake of FV and was used as the outcome of interest, as a binary variable, because only a small proportion of the women reached the recommended intake for these foods (≥ 400 g/day) (1). Logistic regression models with higher intake of FV as the dependent variable (> 178g, yes/ no) adjusted for education (years of study), age (continuous), socioeconomic class (A1-B2/C1-D/E), and adequacy of BMI by gestational age (adequate/ excessive) were used to evaluate the relationship between food environment perception variables and FV intake. The forward selection process was employed for the definition of adjustment variables. Significance level was set at P< 0.05.The analyses were performed using SPSS Software version 17.0 (SPSS Inc. Woking, Surrey, UK). Among the 282 pregnant women investigated most were between 20 and 29 years old, married or cohabiting, with eight to 11 years of education, selfreported Caucasians, and belonging to socioeconomic class C. The estimated median (P25, P75) intake of FV was 41 (32, 109) g among women classified with lower intakes of FV (< 178 g/day), and 190 (170, 232) g for women with higher intakes of these foods (≥178 g/day). The proportion of women who reached the ≥ 400 g/day recommended by the World Health Organization (1) was 10%. 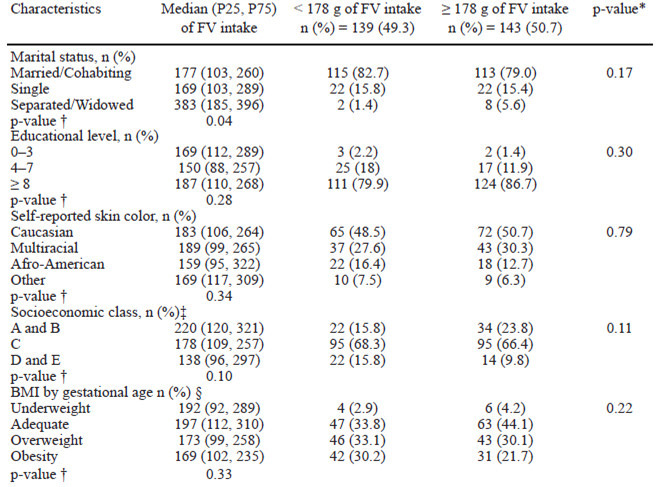 Women with higher intake of FV was older [28 (5) years], when compared with those with lower intakes [27 (4) years], p <0.05. No differences in the marital status, educational level, socioeconomic class, and adequacy of BMI by maternal age across categories of FV intake were found (Chi-square test). However, a higher median intake of FV was verified among separated or widowed women, when compared with the single and married (Kruskal-Wallis test) (Table 1). Table 1. Socio-demographic characteristics of pregnant women according to fruit and vegetable (FV) intake. Ribeirão Preto, São Paulo state, Brazil, n= 282, 2012. * Chi-Square test for differences across categories. † Kruskal-Wallis for differences according to the characteristics. ‡ According to the Brazilian Criteria for Economic Classification (25). § According to Atalah criteria (26). In logistic regression models adjusted for age, education, socioeconomic class, and adequacy of BMI by gestational age, no associations were found between self-perceived food environment and FV intake (Table 2). Moreover, no associations between a longer distance from home (> 10 minutes of walk) and grocery stores [OR 0.87 (IC 95% 0.46, 1.61)], coffee shops [0.80 (0.49, 1.32)], bakery [0.76 (0.46, 1.26)], convenience stores [0.87 (0.46, 1.62)] or restaurants [1.38 (0.74, 2.57], and FV intake were found. *Bivariate logistic regression models. OR: odds ratio. CI: confidence intervals. †Logistic regression models adjusted for age, education, socioeconomic class, and BMI by gestational age. Table 3 describes the relation between food practices, family support, and FV intake in pregnant women. In logistic regression models adjusted for age, education, socioeconomic class, and adequacy of BMI by gestational age, it was observed a positive association between having four or more meals per day and a higher intake of FV. The median (P25, P75) intake of FV of women who reported having up to 3 meals a day was 153g (92, 248), and among those with more than 4 meals a day was 187g (108, 295). Similarly, a positive association between the belief of an adequate intake of FV and a higher intake of these foods was found. The median intake of FV by pregnant women who believed that they consume enough FV was 231g (127, 321), and among those who did not was 139g (96, 214). Moreover, women who reported family support to have a healthy diet were more likely to consume greater amounts of FV, after multiple adjustments. The median intake of women with family support was 200g (113, 300), and those who did not was 130g (91, 214). *Bivariate logistic regression models. OR: odds ratio. CI: confidence intervals. †Logistic regression models adjusted for age, education, socioeconomic class, and BMI by gestational age. ‡ p < 0.05, § p < 0.001. In adjusted models, no association between the places that the women usually have meals, as at work [1.11 (0.66, 1.87)], at friend´s or relative´s houses [0.92 (0.56, 1.15)], self-service restaurants [1.67 (0.91, 3.06)] or coffee shops [1.32 (0.77, 2.26)] and FV intake was found. Moreover, no association between the place that women usually buy foods, like supermarkets, farmers markets, grocery store [1.01 (0.56, 1.81)], coffee shops [1.19 (0.57, 2.51)], bakeries [1.18 (0.67, 2.09)] or convenience stores [0.90 (0.31, 2.65)] and FV intake was observed. The results of this study suggest that factors related to the self-perceived food environment were not associated with consumption of FV among the pregnant women studied. Nevertheless, women who reported having four or more meals per day, those who believed they consumed enough FV, and who reported to have family support for a healthy diet were more likely to consume greater amounts of FV after multiple adjustments. Increasing evidence suggest that the prevention of chronic diseases in adult life should involve strategies throughout the life-cycle, starting in the antenatal period (13). Thus, investigations of the predictors of a healthy lifestyle in pregnant women are of utmost relevance. To our knowledge, no previous studies have investigated the relationship between self-perceived food environment and consumption of FV in pregnant women. In the present study, our results might be partly explained by the fact that, food practices of women during pregnancy are usually permeated by beliefs about which food should be eaten, values, tastes, desires, proscriptions, and prescriptions, enabling them to overcome the barriers inherent to the food environment. A systematic review have examined the association between food environment and diet in adult population, and found a moderate evidence of the causal effect of the neighborhood food environments on dietary intake (9). The perception about questions such as proximity to stores for FV in the neighborhood and quality and variety of these foods showed no direct association with higher FV intake among pregnant women in our study. Nevertheless, previous findings regarding the relationship between food environment and diet are inconsistent, regardless of the methodological approach (9). For instance, in a study conducted in New Zealand, the distance of the residences to the nearest supermarkets or convenience stores were not associated with FV intake (20). On the other hand, on a study conducted among Australian children, an inverse association between vegetable intake and the distance between the residence and fast food outlets and supermarkets was found (21). We found no association between the self-perceived quality and variety of FV at the food stores and higher consumption of these foods. A similar result was reported in a study conducted in Americans, in which no association between individual satisfaction regarding the variety, quality, and cost/accessibility of FV and higher consumption of these foods was found (22). In the present study, our data showed a positive relationship between women who reported having four or more meals per day and a higher probability of consuming adequate amounts of FV. This result is consistent with findings of a study with Japanese-Brazilians that showed that those who reported to have more meals per day had a higher probability of reaching the recommended daily intake of FV of 400g (23). A possible explanation for this fact is that women who have more meals per day may opt to include fruits in those meals, thus increasing the daily intake of this food group. Additionally, the fact that our population differs from the Japanese-Brazilians suggests that the association between a more meals per day and eating adequate amounts of FV is not population-specific. A study conducted among 5,130 adults in Austria found that the fact of individuals considering they consumed adequate amounts of FV prevented them from increasing their intake, even when it was lower than the recommended (24). In the present study, the results also showed a positive association between pregnant women who considered they consumed adequate amounts of FV and a higher intake of these foods. However, even though perception of adequate intake is directly associated with higher FV intake, actual intake in this study was much lower than recommended. The estimated mean FV intake among pregnant women in this study was 207 g, and only 10% of the women evaluated in this study reached the recommended intake of 400 g/day of FV. A randomized clinical trial conducted amongoverweight adults in England, evaluated the impact of strategies to promote a healthy lifestyle and found that the social support was relevant for adopting a healthy diet (25). Our results showed that women who reported family support to have a healthy diet were more likely to consume greater amounts of FV, suggesting that the social support contribute to improve the quality of dietary intake. The main limitation of this study is its crosssectional design, in which causal inferences cannot be made, due to the nature of the study design. Therefore, randomized clinical trials are necessary to confirm such hypothesis. Moreover, the seasonal variation of FV intake was not evaluated, which could influence the results, and the questionnaire used to assess the self-perceived food environment and food practices was not previously validated. Nevertheless, the strengths is that this is the first one to investigate predictor factors related to self-perceived food environment, food practices and family support for a healthy diet and FV intake during pregnancy, and the first such study conducted in a developing country. Because most pregnant women are willing to improve their lifestyle during this phase of life to protect their baby, novel strategies aimed at improving the intake of FV are in great need. Knowing which factors, in a given population, are associated with an adequate intake of these foods is essential to design nutritional intervention programs. Our data suggests that to achieve optimal FV intake among pregnant women strategies promoting four or more meals per day, and family support might be relevant. This study was supported by the FAPESP (scholarship to DCCZ 2011/03558-7), and grant from FAEPA, and CNPq (472221/2010-8). Yin Z, et al. A population-based case–control study of risk factors for neural tube defects in Shenyang, China. Childs Nerv Syst 2010; 27:149-54. Nwaru BI, et al. Maternal diet during pregnancy and allergic sensitization in the offspring by 5 yrs of age: a prospective cohort study. Pediatr Allergy Immunol 2010; 21(1 Pt 1): 29-37. Olson CM, Strawderman MS. Modifiable behavioral factors in a biopsychosocial model predict inadequate and excessive gestational weight gain. J Am Diet Assoc 2003;103:48–54. Kamphuis CBM, Giskes K, de Bruijn GJ, Wendel-Vos W, Brug J, van Lenthe FJ. 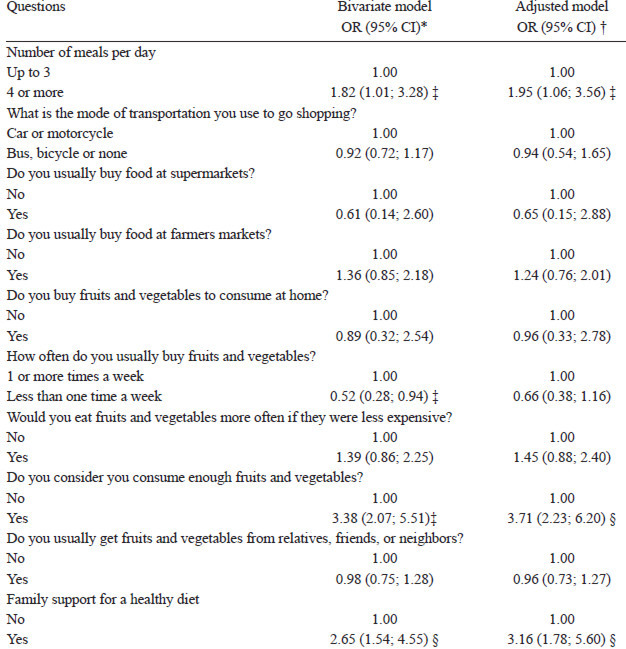 Environmental determinants of fruit and vegetable consumption among adults: a systematic review. Br J Nutr 2006; 96: 620-35. Casey AA, Elliott M, Glanz K. Impact of the food environment and physical activity environment on behaviors and weight status in rural U.S. communities. Prev Med 2008; 47:600-04. Laraia BA, Siega-Riz AM, Kaufman JS, Jones SJ. Proximity of supermarkets is positively associated with diet quality index for pregnancy. Prev Med 2004;39: 869-75. Caspi CE, Sorensen G, Subramanian SV, Kawachi I. The local food environment and diet: A systematic review. Health Place 2012; 18 (5):1172-87. Echeverria SE, Diez- Roux AV, Link BG. Reliability of self- reported neighborhood characteristics. J Urb Health 2004; 81(4): 682-01. Flint E, Cummins S, Matthews S. Do perceptions of the neighborhood food environment predict fruit and vegetable intake in low income neighborhoods? Health Place 2013; 24: 11-15. Canesqui AM, Garcia RWD. Antropologia e Nutrição: um diálogo possível. Rio de Janeiro: Fiocruz; 2005: 24-25. Robinson S. Introduction to early life and later disease. In: British Nutrition Foundation (Org). Nutrition and Development: short and long-term consequences for health. United Kingdom: Wiley-Blackwell; 2013. p. 1-13. Jaime PC, Monteiro CA. Fruit and vegetable intake by Brazilian adults, 2003. Cad Saude Publica 2005; 21 (Supl):19-24. Zuccolotto DCC, Bertola MR, Isobe MT, Sartorelli DS. Reprodutibilidade de questões do ambiente alimentar e acerca do consumo de frutas e hortaliças entre gestantes. Rev Nutr 2013; 26(6): 727-35. Barbieri P, Nishimura RY, Crivellenti LC, Sartorelli DS. Relative validation of a quantitative food frequency questionnaire for use in Brazilian pregnant women. Public Health Nutr 2013;16 (8): 1419-26. Harttig U, Haubrock J, Knuppel S, H Boeing. The MSM program: web-based statistics package for estimating usual dietary intake using the Multiple Source Method. Eur J Clin Nutr 2011; 65 (Suppl 1): 87-91. Atalah SE, Castillo CL, Castro RS. Propuesta de um nuevo estandar de evaluacion nutricional em embarazadas. Rev Med Chile 1997; 125: 1429-36. Associação Brasileira de Empresas de Pesquisa (ABEP). Dados com base no Levantamento Sócio Econômico 2010 – IBOPE. 2012. Available in: www.abep.org. Pearce J,Hiscock R,Blakely T, Witten K.The contextual effects of neighborhood access to supermarkets and convenience stores on individual fruit and vegetable consumption. J Epidemiol Community Health 2008; 62 (3):198-01. Timperio A, Ball K, Roberts R, Campbell K, Andrianopoulos N, Crawford D. Children's fruit and vegetable intake: associations with the neighbourhood food environment. Prev Med 2008; 46: 331-35. Zenk SN, Lachance LL, Shulz AJ, Mentz G, Kannan S, Ridella W. Neighborhood Retail Food Environment and Fruit and Vegetable Intake in a Multiethnic Urban Population. Am J Health Promot 2009; 23 (4): 255-64. Palma RFM, Barbieri P, Damião R, Poletto J, Chaim R, Gimeno SG. Fatores associados ao consumo de frutas, verduras e legumes em nipo-brasileiros. Rev Bras Epidemiol 2009; 12: 436-45. Schatzer M, Petra R, Elmadfa I. Fruit and vegetable intake in Austria adults: intake frequency, serving sizes, reason for and barriers to consumption, and potential for increasing consumption. Public Health Nutr 2009; 13 (4): 480-87. Gillison F, Stathi A, Reddy Prasuna, Perry R, Taylor G, Bennett P et al. Process of behavior change and weight loss intervention program: a test of the process model for lifestyle behavior change. Int J of Behav Nutr Phys Act 2015; 12 (1):2.